In the past season, an unlikely star has risen in the fashion world, and proved to be an ever expanding trend among trend setters. That star is the bug, or insect. From Christopher Kane’s striking dress, to Bee flats everywhere, and a rise in bug related brooches, pins and jewelry, it seems that there’s no stomping out the bugs from the fashion world. But, for those who remember, this fascination with bugs goes back decades, showing up in both fashion and film. 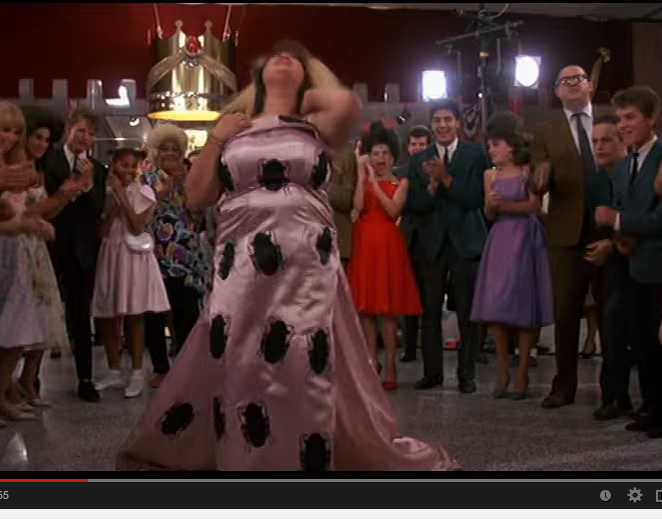 Ricki Lake outshining the stars of show with her song, Bug in Hairspray. The original. “You don’t just walk into a meeting and say Bug” – John heard in Big. Upon galavanting around the streets of Southampton earlier this summer, I stumbled upon the store Keogh + 51 Inc. A bright, yellow, bug printed dress was displayed proudly from their window, and I immediately felt compelled to see more. Once inside, I met the lovely Erin; the designer of Keogh Collections. 25 minutes later, I had a new friend, and a new dress for NYFW. Though it’s a little tighter then I would normally wear, I can’t deny it’s flatter-ability and the soft, fleece feel of the cotton is so comfortable. Inside, inspirational quotes line the back reminding me that fashion is always inspiring us, in one way or another. Trends may come and go, but this is one dress that will never bug me. 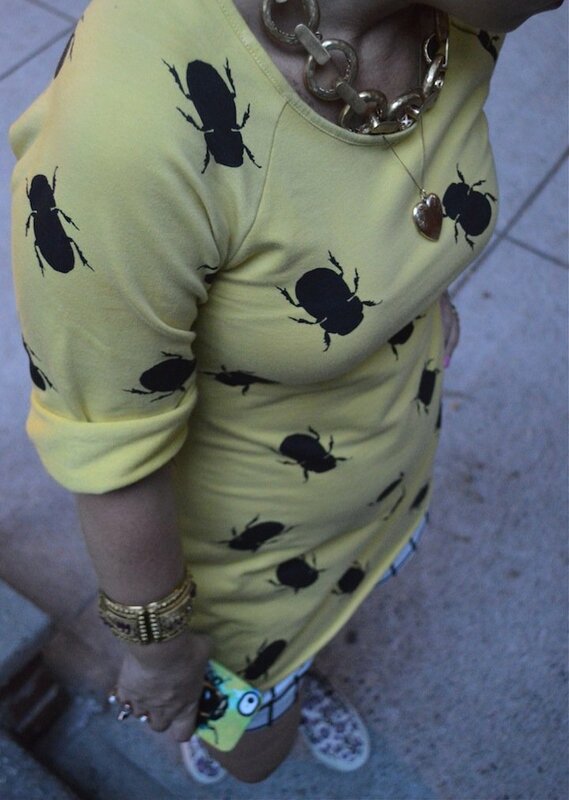 Bug Dress, Keogh Collections. White leather window pane shorts, Forever21. On sale for $25 here. Bee flats, Mother of Pearl at MatchesFashion.com. Other styles here. Jewelry: Gold necklace, Julie Vos. 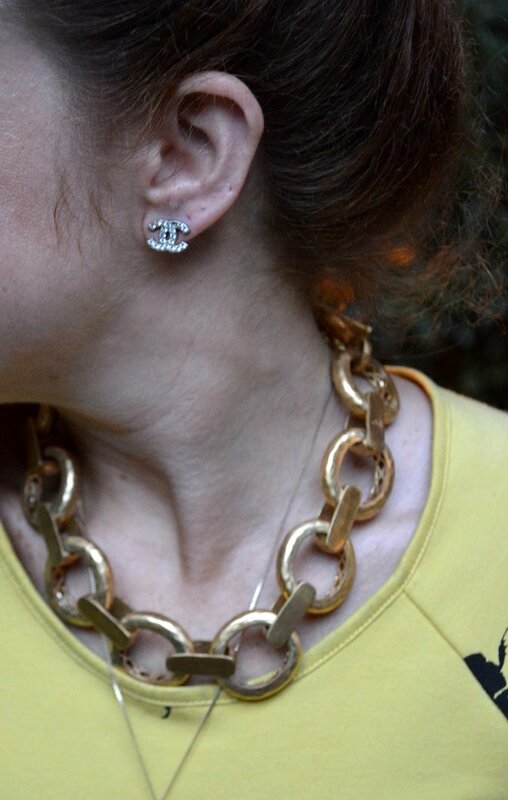 Chanel earring. 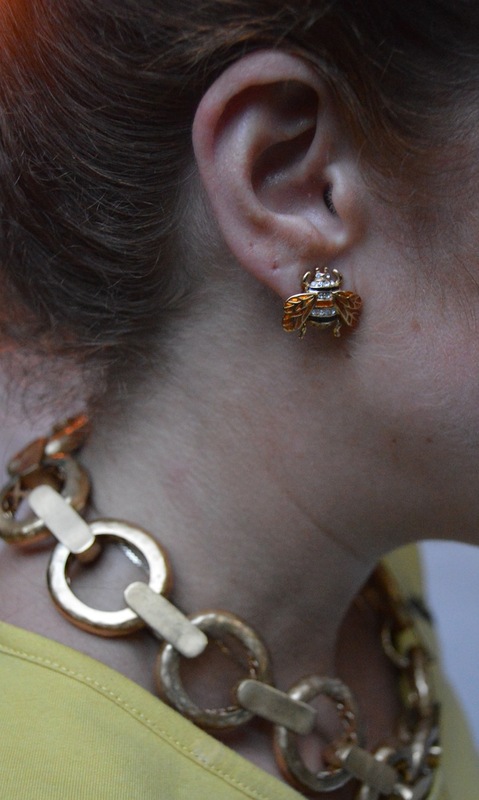 Bee earring, Kate Spade. Gold cuff, vintage, My Mothers Closet.